The Syrian Government Is Bombing Hospitals, Clinics And Health Workers : Goats and Soda Over 300 hospitals and clinics have been hit with bombs and missiles. Nearly 700 medical workers have been killed. Only Syrian President Bashar Assad has the air power to conduct these attacks. A first responder in the rebel-held city of Aleppo carries a child who was wounded in a government airstrike on Sept. 16. 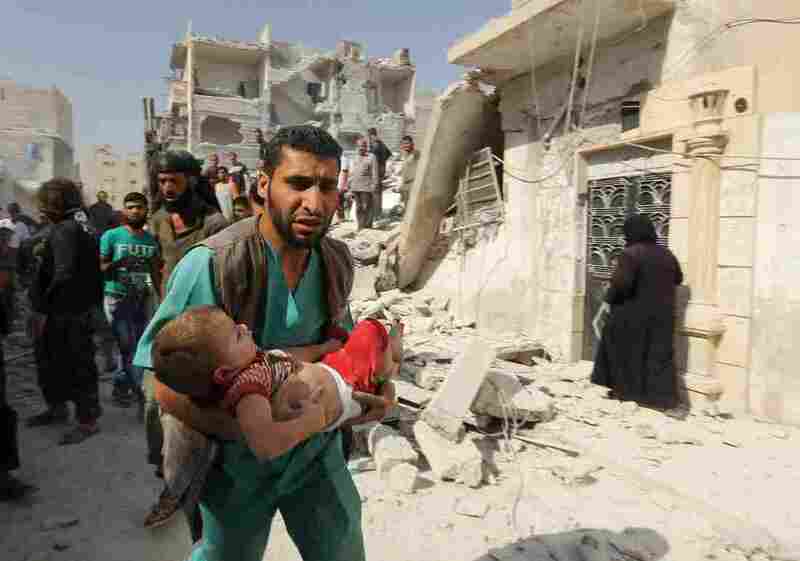 It's dangerous to practice medicine in Syria. When I called up a physician based in the city of Aleppo, he said he'd have to call me back — there had just been a missile strike. And Doctors Without Borders has released a statement saying that one of its hospitals in Homs was partially destroyed in a bombing on Saturday. Since the conflict in Syria began in 2011, nearly 700 medical workers have been killed and more than 300 facilities have been hit with missile strikes and bombs, according to the advocacy group Physicians for Human Rights. In an article last month in the New England Journal of Medicine, American doctors said that their counterparts in Syria need help: The disruption of health services has become a weapon of war that the Syrian government is using against those opposed to President Bashar Assad. Last year, Dr. Majed Aboali made the tough decision to leave behind his home and clinic in Syria and move across the border to Turkey. He says he did it for his family. He had a 1-year-old, and "it was too hard to get some milk for your kids or diapers or even some food." Now Aboali supports the Syrian medical community from afar, by coordinating aid. When doctors in Syria are stumped on a medical issue, he coaches them over Skype or connects them with other doctors who can do the same. Many of his colleagues who stayed behind are missing or dead. He lists their names: "Dr. Adnan Wahbie was killed in 2012 in his clinic; Dr. Osama Baroudi, he was tortured to death in prison; Dr. Mahmoud Rifai has been arrested since 2012." And the toll continues to mount. Shortly after I spoke with Dr. Rami Kalazi, a neurosurgeon based in Aleppo, last week, he emailed me to say that one of his colleagues had just been killed in a bombing. The hospitals that are still standing often lack the basics. Aid groups are trying to smuggle in supplies, Kalazi says. But it's never enough. 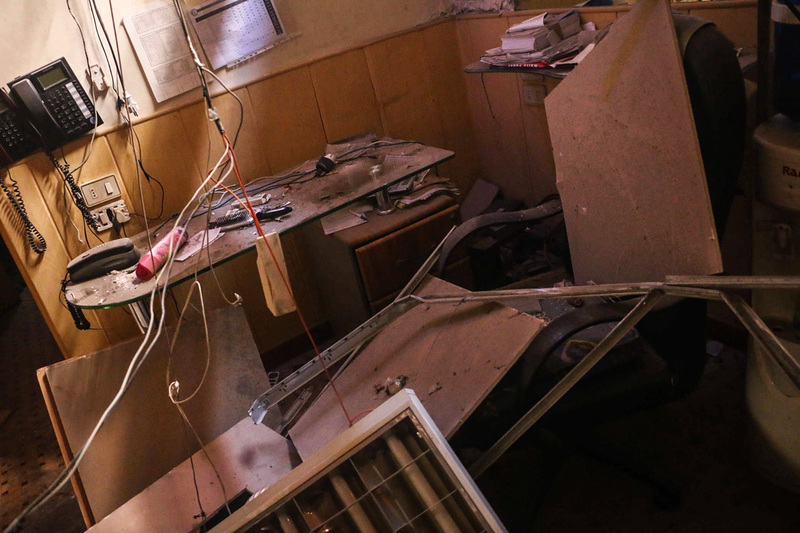 Dr. Majed Aboali's clinic in the opposition-controlled region of East Ghouta was destroyed last October. "We don't have electricity, we don't have water, we don't have fuel," he says. About two years ago, Kalazi had to operate without a CT scanner. A 10-year-old patient came in with a head injury. "And we didn't have a working CT scanner in Aleppo city at that time," he says. So he had to make an educated guess about what was wrong. "Luckily my assessment was correct," he says. The boy survived, but it was a close call. The intensity and the types of bombs government forces are dropping from helicopters are causing incredible damage, ripping off limbs and perforating bodies with shrapnel, says Kalazi: "In this war we have seen injuries we haven't seen in books." Despite the challenges, he and his wife — who is also a doctor — have decided to stay in Syria for now, even though he's been on the government's wanted list for years. His charge? Treating, and therefore helping, terrorists. "It's hard, it's dangerous, I know," Kalazi says. Their hospital has been hit 35 times since the conflict started. "But if I go, there will be no one else with my specialty left." The government has not admitted to targeting doctors, says Elise Baker at the Physicians for Human Rights, who runs a project that maps attacks on medical centers. Yet among the various factions involved in Syria's civil war — which includes anti-government rebels and ISIS — Assad's military is the only one with access to air power, she points out. The military sometimes claims that a hospital is a front for a terrorist base, she says. To keep track of these attacks, Baker and other researchers scour through social media and reach out to Syrian doctors directly. "Things are not improving," she says. "So it's really frustrating and upsetting to be doing this documentation and speaking with doctors who are working at these hospitals and are asking for just one thing: For the attacks to stop." What the government is doing — targeting doctors and hospitals — is against international law, according to David Phillips at Columbia University's Institute for the Study of Human Rights. "That was clearly established in the Geneva Conventions in 1949," he says. "Unfortunately when you're dealing with rogue regimes, or terrorist groups, the rules of engagement are thrown out the window." Similar tactics were used in the Bosnian conflict of the early '90s and in Kosovo in '98. Phillips says he is not too optimistic about the situation in Syria. Ultimately, he believes, the U.S. and the international community need to pressure the Syrian government to stop the violence. The Syrian doctors I spoke with say they don't know if or when that will happen. They just want the war to end.